Cory Caswell has worked as a hired hand on Wyoming and Montana ranches since he came west as a teenager, not staying in any one place longer than a few months. 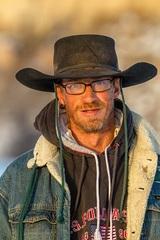 He talks about his hard, unpredictable but satisfying life as itinerant ranch hand. As a child on the Crow Reservation in Montana, Peggy White Well Known Buffalo was taken from her home and sent to Bureau of Indian Affairs boarding schools out of state, and forbidden from speaking her language. As an adult, she has dedicated her life to helping Crow children connect with their history, their culture and their place. Lambert, a small Eastern Montana town near the Bakken oil fields, copes with sudden and dramatic change. Last week we heard from 103-year-old Margaret Carranza, who came from Mexico to Montana's Yellowstone River Valley when she was a girl to work in the sugar beet fields. This week we will hear the story of how her family finally acquired a farm of their own - only to have it taken away. The first in a two-part series about Margaret Carranza, a 103-year-old, Mexican born woman who spent her life as a beet worker in Montana's upper Yellowstone River valley.